The implementation and efficiency of your value creation processes directly affects your company results. It is therefore important for your processes to be presented transparently, optimised on an ongoing basis and applied accordingly. As shown in the graphics, processes are continuously affected by adaptation of the objectives and the resulting changes in operational control. Other relevant factors are changes, improvements and innovations which necessitate the adaptation of processes. Today the business world is changing with increasing rapidity. Our experience shows that, business processes become outdated in two to three years, so that potential for optimisation can no longer be used systematically. Since efficient processes are no longer being followed, the result is entrepreneurial risk. The adaptation of the processes to altered conditions is associated with high costs, as the processes have to be re-developed from scratch. With regular maintenance, processes can be continuously adapted to the current situation. The processes remain transparent, flexible and manageable. 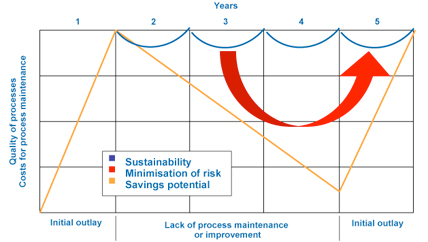 The following image shows sustainability, risk reduction and savings potential resulting from continuous process maintenance, in simplified form and based on experience values. MAK supports you in all phases – from analysis, design and implementation to continuous improvement of your process maintenance.